Your family would enjoy riding in a new full-size luxury sedan if you could find one that gives everyone access to new technology features. The Chrysler 300 is a popular choice for people like you and it gives you the modern technology features that you and your family want. Is the sound quality in your vehicle something that is important to you? Are you interested in upgrading the speakers in the vehicle that you are going to drive so that they will offer you exceptional quality? 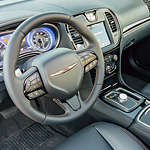 The Chrysler 300 gives you the option to get set up with a premium sound system with 19 speakers. It can be helpful to have USB ports in your vehicle for connecting phones to the vehicle and charging all of your devices. The Chrysler 300 provides you with two USB ports that you and your family can put to use while you are on the road.